The Rebel Sweetheart. 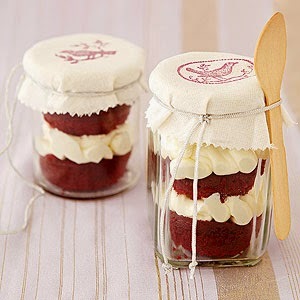 : Foodie Goodie | Red Velvet Cupcakes in a Jar. Cupcakes in a jar are all the rave these days. They're so popular that I see them every so often on social media sites - on Facebook, Twitter, and Instagram. Especially Instagram. And with Christmas just around the corner, these bottled desserts are ubiquitous now more than ever. They're a sure-fire hit at any party - especially with the kids, and they make great gifts and giveaways, too. If you'd like to take a shot at making these 'mashed confections', here is a quick and easy recipe that you can follow. 1. In a large mixing bowl beat butter with an electric mixer on medium to high speed for 30 seconds. 2. Add 2 cups of the powdered sugar, the milk, and vanilla. Beat until smooth. 3. Add remaining powdered sugar and beat until combined. 4. Beat on high speed for 2 minutes. 5. Place frosting in a pastry bag fitted with a large star tip or in a zip-top bag with one corner cut; set aside. 6. Cut cupcakes in half horizontally. 7. Place bottom half of cupcakes, cut side up, in half-pint canning jars. Pipe frosting on top of each. 8. Add cupcake tops, cut sides down. Pipe frosting on top of each. 9. Add lids to jars and decorate as desired. These look delicious! I would love to give these jars for Christmas gift to my neighbors. Yummy, I am going to have to make these. I will probably skip the jars. What a great idea! I'm thinking of making something like this for my co-workers. I'm sure they'd like a sweet treat. I think the jar treats are so cute. This would be a great one to make and gift for the neighbors. Is red velvet cupcake mix is available in local supermarkets? This is awesome and would make a great gift for Christmas indeed. I will have to try this recipe. Thanks for sharing. What a cute gift idea! I've always wanted to try this.